Tuesday night we met at Cathy’s house instead of a public place where moving every two minutes with a timer ringing would be a nuisance. We started on her deck to the sound of burbling water and birds singing and lovely sights all around and warmed up with an untimed sketch. 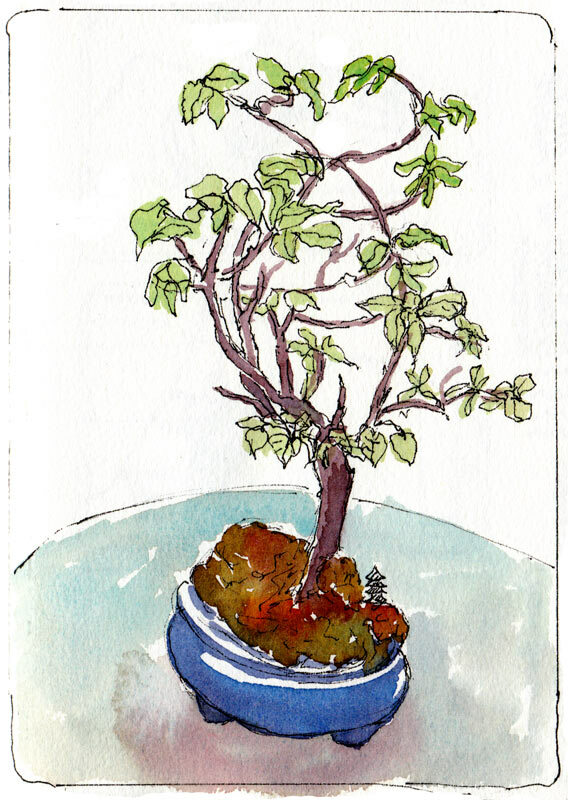 Drawing this little bonsai on the table in front of me was just what I needed to unwind from the crazy day. The sun went down and it was nearly dark when I painted it. Then we went inside and started the timed two-minute sketches. Cathy’s Berkeley Craftsman style home is a serene oasis decorated with simplicity and a Japanese zen style. Open space and emptiness balances still-life displays of special objects, art and her wonderful collections. She set the timer for two minutes and said “Go” and we moved through the house, our eyes and pens devouring tender new morsels around every corner every two minutes. 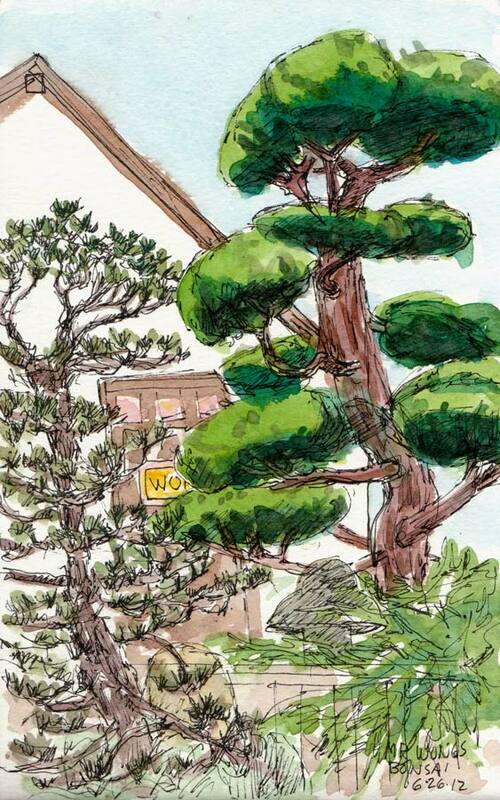 I added the watercolor at home later for these two sketches. 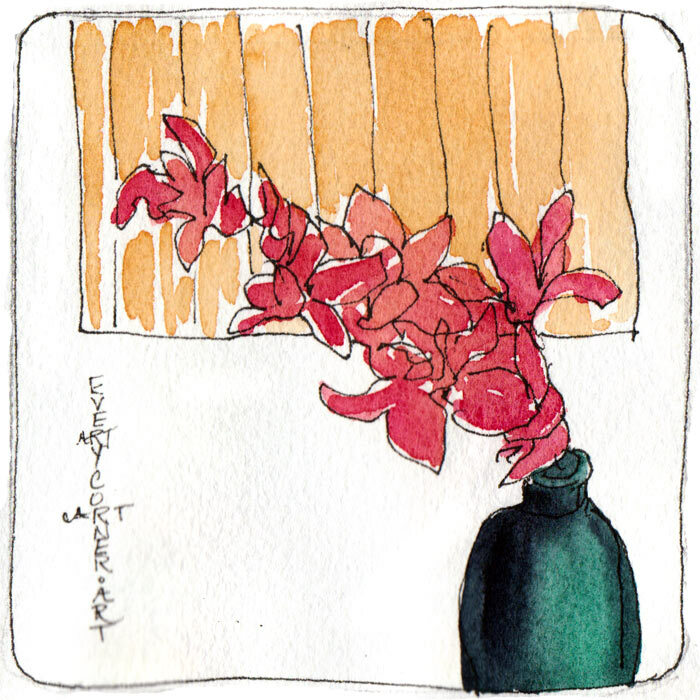 After each set of 6 two-minutes sketches we met back at the dining room table to look at each other’s sketches. 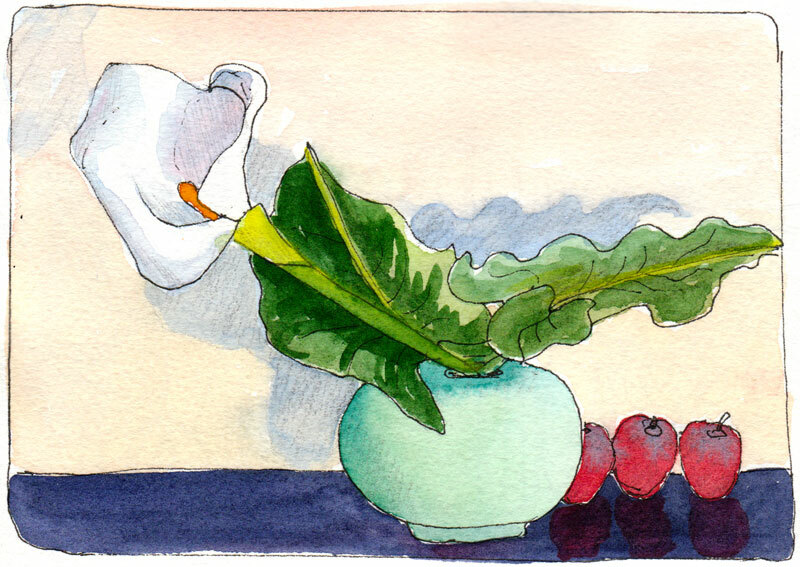 When I saw Sonia’s calla lily and apples sketch I realized I’d missed that corner. I liked that display so much I chose to ignore the two-minute bells and spent six minutes enjoying drawing this one. I’ll post the rest of the sketches after I add color to them. I am soooo lucky to have such great, dedicated sketching buddies!